Hello crafty friends! 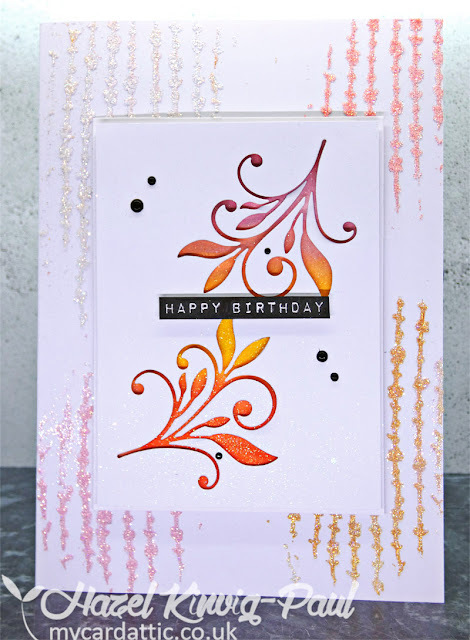 I am popping in today to show you my latest card. It is for my Mum's birthday. I couldn't even find the inspiration for that. I have to admit to cheating . . . badly. You might recognise this one. It is a card that I had made previously and had in my stash, which I cut the front off and mounted it to a larger card base on which I embossed with a stencil, colouring the paste to the colours used on the card. I sprinkled the paste with iridescent glitter before it was dry. In the meantime, whilst my mojo has deserted me, I am doing some sewing (that doesn't require any creative input). 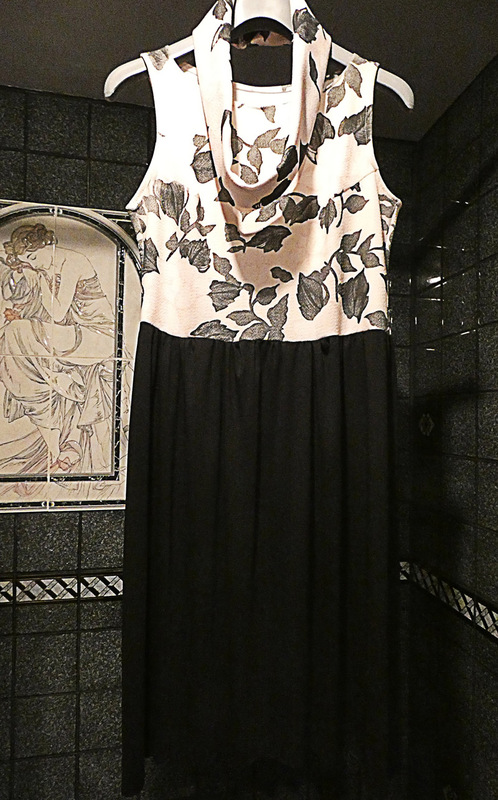 Above is a dress that I made by attaching a piece of plain black fabric - that I gathered - to a sleeveless top that I made a little while ago. 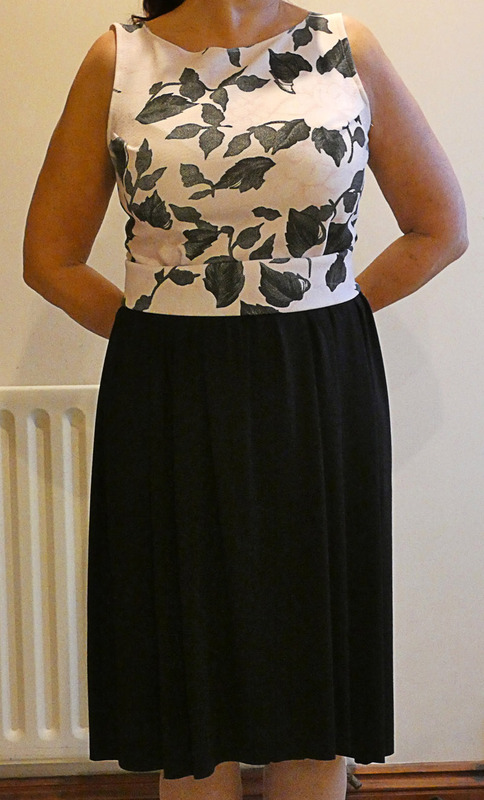 The piece hanging around the neck of the hanger is a 'self belt', made from the same fabric as the top. Great use of a previous card, Hazel - I do this too when a card has been in the stash. Just love the stencil behind - nice texture! 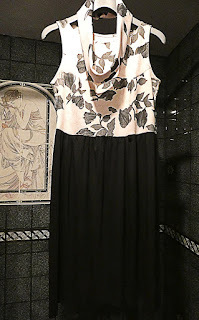 You should use your lovely dress for inspiration - I love the patterned top with the black skirt!! Your card is very pretty! And the dress, I can’t believe you made that! It looks just lovely on you! Your dress is lovely, and it certainly DOES take creativity to sew!!! I don't think it is cheating at all to make a card using parts of an older one. If that were the case, we'd be cheating every time we redecorated our homes and incorporated any of our old possessions. It's not cheating at all. It's just plain smart! Oh,my friend, I am so impressed with your lovely dress!!!!! How clever to add the black bottom to the top!!!!! 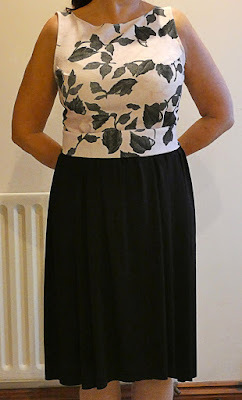 I love the patterned fabric you used for the top and the black bottom works perfectly with it!!!! The belt ties it all together beautifully!!!!! And very creative thinking to use a card you had to create a stunning card for your mom!!!!! I love the subtle shine on the card!!!! Happy birthday to your mom!!!! The card for your mum is gorgeous, Hazel! I'm sure she will love it! It looks like your mojo is going into sewing. What a lovely dress! I have no mojo for sewing anymore! Love the dress, it is beautiful and you are still creating something gorgeous. Give it time. Simply stunning dress and this looks so beautiful on you! Just love the pretty fabric. Your card is just as wonderful! Talented one...your card is fabulous and that dress...gorgeous. Heres hoping you realize you don't need mojo to make a lovely card. Beautiful dress, Hazel! Your mojo will return. Your mom's card is beautiful, and I don't consider that cheating! My mojo fell off and got lost some place too... for quite a long time. For me it's three events all too close together - daughters birthday end of Nov., Christmas and then anniversary of her last morning with us - early Jan. I think some of us just need time out to regroup after an emotional overhaul or three... and suspect that for you it's the same. Your dealing with your mum, aware it's Christmas... plus goodness knows what else. I think mojo's disappear to tell us we need to have some TLC for ourselves. Perhaps they are wiser than we think!